In Southeast Alaska, climate change is expected to affect stream temperatures as air temperatures warm and hydrologic patterns shift. Understanding and anticipating these changes will be critical for predicting how salmon species and other aquatic resources be will affected by climate change. With funding from the North Pacific Landscape Conservation Cooperative, SAWC is working with partners to coordinate a regional stream temperature monitoring network. 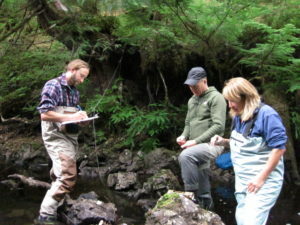 The Network aims to ensure stream temperature data are useful and accessible to management agencies, researchers, and local stakeholder communities. Learn more about the original goals of the NPLCC-funded project here. Rob Cadmus and John Hudson (SAWC) and Cheryl Fecko (Prince of Wales Watershed Association) locate a temperature logger in Rio Roberts and download data. Where are data being collected? If you are interested joining the Network or learning more, please contact SAWC’s Science Director, Rebecca Bellmore.